The information presented on this page was originally released on April 7, 2005. It may not be outdated, but please search our site for more current information. If you plan to quote or reference this information in a publication, please check with the Extension specialist or author before proceeding. An old favorite just got better -- and larger -- with the new Titan series, prompting some to reconsider periwinkles for the garden. 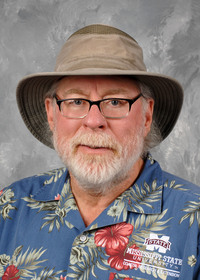 Last year they made their local debut at the Mid-South Greenhouse Growers conference held in Raymond, and growers from several states were mesmerized. The botanical name of periwinkles is Catharanthus, which means pure and without blemish. That is pretty much how we used to feel about them. 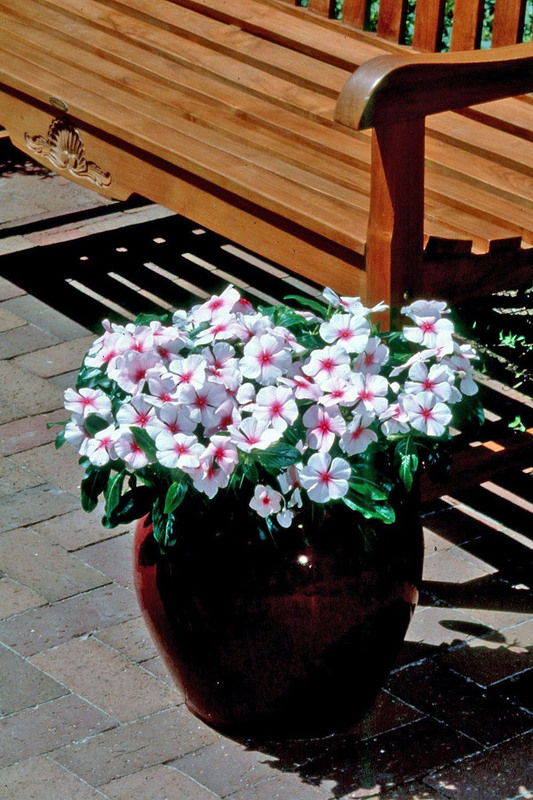 You may remember them as Vinca rosea, but the official name is Catharanthus roseus. The Madagascar periwinkle is a colorful plant that withstands summer heat and has few insect problems. A little-known fact is that this periwinkle has alkaloids used to help treat leukemia. Researchers discovered the cancer-treating properties when periwinkles were being tested for their reported anti-diabetic properties. Periwinkles come in a range of colors including white, lavender and pink, and some have colored eyes. Titan is a new series that is sure to capture a sizeable market-share. Titan made its debut with Blush, which is a light rose color with a deeper rose eye. The one known as Burgundy was very impressive in Mississippi State University trials. You will notice that the Titan periwinkles have by far the largest flowers you have ever seen on a periwinkle. Next in the Titan series came Punch, which is a deep rose pink; Polka Dot, which is white with a red eye; Lavender with a blue halo; and Lilac. There are many other good periwinkles available from the Coolers, Tropicanas and Pacificas to former All-America winners like Parasol and Pretty in Rose. Another that I think is exceptional is a Park Seed release called Passion. It is a deep purple with a yellow eye. Passion planted with yellow marigolds makes a striking combination. One of the most attractive features of the periwinkle is its foliage. The leaves are dark green and glossy, contrasting with the gorgeous flowers. The periwinkle is still an outstanding plant if we avoid planting too early before the soil has warmed. Plant periwinkles in late spring and even summer. While we may suffer from the heat and want to go indoors, these troopers will make beautiful beds. Choose a site in full sun and plant in raised beds for drainage and aeration. Despite their tolerance of heat, periwinkles hate wet feet. Pay close attention to planting depth. Planting individual plants too deeply exposes the roots and stems to unfavorable growing conditions and increases the potential of getting disease. Mulch properly to decrease splashing of rainfall and water from the soil to lower stem foliage. Mulch periwinkles to a depth of 1 to 2 inches. Periwinkles are drought-tolerant once established, so don't over-water. Mulch and plant periwinkles in different beds each year like you rotate vegetable crops. It is possible to have attractive beds of periwinkles that perform all summer just like in the old days. Just remember to avoid planting too early, and be sure to plant in full sun on raised beds. Look for the new Titan series at your local garden center this spring.